First off, I’d like to thank everyone who read the Roads Project, and for their AMAZING responses and questions! It was really heartening and exciting to see that so many people – many of them not from Chennai! – were interested in the women who created history, for Madras and elsewhere. 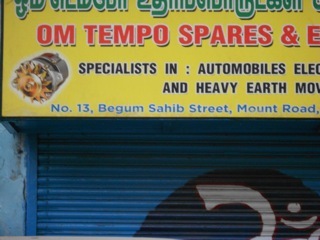 Doing the roads project with Kanchana Venkatesh, one of Prajnya’s summer interns, was like going on a sort of Discovery of Madras tour – with a twist. We’ve spent many days wandering around the city, arguing over which road sign looked most picturesque, and who gets to take the final photo! Initially we planned to do thirty-one roads, and have enough posts for the entire month of August. However, this was before we took a closer look at not only how many roads are named after women, but also how much information is available about these women. Getting information about some of these women was impossible. For example, the only thing I was able to ascertain about Jayammal (of Jayammal road, Teynampet) was that she was the mother of dancer Balasaraswati. 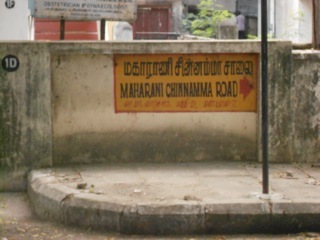 Other women who have roads named after them didn’t even figure in books and web searches (Kamalabai street, T Nagar; Muktharunissa Street, Triplicane; and Navaneethammal Street – to name a few). Even a public figure like Rani Annadurai was mentioned only a couple of times in any biography of C N Annadurai. Who were these women, and if they were deemed important enough to have roads named after them; then why isn’t any information about them available? If any of you have any idea who they were, please write in and tell us! This brings us to another issue: if these women weren’t public figures, do they merit having roads named after them? 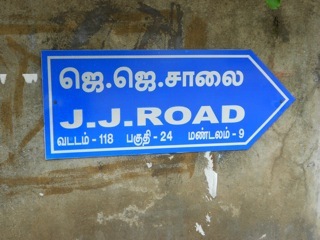 For example, if Rani Annadurai was not an activist, why is there a road named after her? Annai Nagammai, Periyar’s wife, certainly played a large role in the freedom movement; and his second wife Maniammai was part of the Dravidian movement. On the other side of the coin, though, it can be argued that Annadurai was able to rise in public life only because of the support he received at home from his wife and family. We must acknowledge the role of these largely invisible women in the lives of public men. Do you think Annadurai would have risen so quickly in the ranks of Tamil Nadu politics if he was bogged down in domestic duties? Who knows? One question that came up in the comments and responses was this: when we’d stated in the introductory post that we’re not planning to include roads named after goddesses, why did we include a mythical figure like Kannagi? The same question went for Avvaiyyar and St. Mary. I’ll be the first one to admit that no project is perfect. The reason I didn’t want to include goddesses in the Roads Project was simple: it would never end! I also feel that Avvaiyyar is still relevant in today’s education system, where children study her teachings. Kannagi has been used as a symbol in the Dravidian movement in the days since Periyar originally disowned her as an ideal woman; saying that chastity is a sexist concept and should not be applied only to women. Since then, attitudes towards Kannagi have changed with the change in government. No discussion of the Dravidian movement is complete without a mention of her significance. With regard to St Mary, while the miracles around her may or may not be true, the fact that Jesus (an important historical figure) was her son makes her a “real” person. When we first started this project, I hadn’t really imagined a situation in which we’d need a concluding post. However, your responses and your questions made it necessary! Also, when we were actually in the thick of doing the research and finding out about these women, there were so many things we wanted to say about the process and the paucity of information that we decided to go ahead and write this conclusion. Once again, I’d like to thank all of you for following this series everyday – I hope you had an enjoyable and enlightening three weeks! 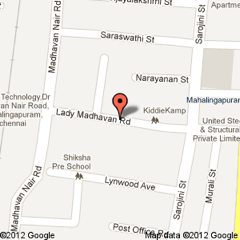 Where is Lady Madhavan Road? 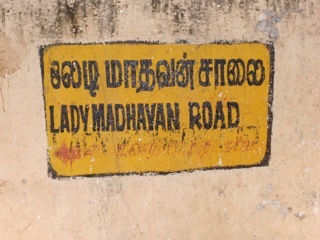 Lady Madhavan Road is in Mahalingapuram, near the Aiyyappan Koil. 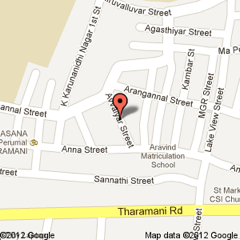 It is perpendicular to both Madhavan Nair road and Sarojini Road (covered on Day 13). Who was Lady Madhavan Nair? Lady Madhavan Nair was born K Parvathi Ammal of Karumathil. Her father was C Shankaran Nair, who eventually became a member of the Viceroy’s council. She was eldest of five daughters, and had one older brother. Parvathi Ammal was not a very diligent student. She took every opportunity to miss class. She studied in a convent in Madras. Once, when her parents were away in England, they received a letter from the school complaining that their two eldest daughters had “bunked” classes and were cycling all over the city! She was an accomplished violinist and enjoyed singing. She was enthusiastic about amateur theatricals, and roped her sisters into putting up many plays, including Bluebeard. When she was about ten years old, she had a private tutor, along with her sister Kalyani. They were mischievous students, and would not pass up an opportunity to tease the tutor; even having a laugh at his expense right in front of him! Parvathi Ammal married Madhavan Nair in Ottapalam, in April 1911. He was her cousin. Madhavan Nair was also an eminent freedom fighter, journalist and writer. He was the founder-editor of the Mathubhoomi daily. He was later a part of the Privy Council, and was knighted. They lived at Lynwood estate, which is now Mahalingapuram. They owned a large property, which Lady Madhavan Nair later donated to the Aiyyappan temple, which is constructed on land that formerly belonged to her. Lady Madhavan Nair also got her father’s autobiography published in 1966, almost thirty years after he passes away in her house. 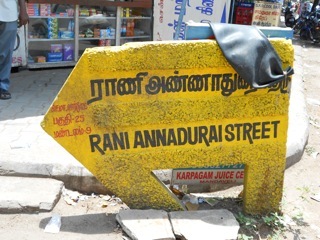 Where is Rani Annadurai Street? 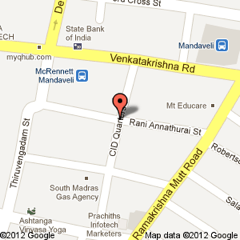 Rani Annadurai Street is a left turn leading off from RK Mutt Road just before the Mandevalli signal. 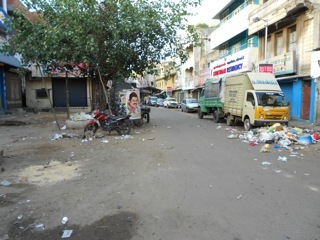 It is parallel to Annai Nagammai street (covered on Day 9 of the Roads Project). It’s incredible that in a movement that is extensively documented (the Dravidian movement), we know everything about its male leaders, but almost nothing about the women in their lives. Rani Annadurai was married to C N Annadurai, founder of the Dravida Munnetra Kazhagam (DMK) and former Chief Minister of Tamil Nadu. They were married while Annadurai was a student in Pachaiyappa’s College, Chennai. Their marriage was an arranged one, the bride and groom hadn’t even met before the ceremony. In spite of Annadurai’s atheist beliefs, the marriage was conducted in a traditional Hindu style, with the attendant rituals. Rani and Annadurai had no children of their own, and adopted Annadurai’s elder sister’s children. His sister, Rajamani Ammal, is said to have raised him. She subsequently moved in with Anadurai and Rani, and looked after their household. Rajamani Ammal had four sons, and Annadurai adopted all of them. Rani was very supportive of Annadurai’s work and political career. She notes that she would never disturb him while he was studying late at night, since she realized that his work was in the service of the nation. She visited him frequently when he was imprisoned for his role in he anti-Hindi agitation. Annadurai was a very austere man, who never sought to gain any assets from his position as Chief Minister. This seems to have grated on Rani’s nerves – she tells a story about how he wouldn’t even allow her to take a sofa intended for office use and put it in their home. At this time, his office was in his home! Kannan, R. Anna: The Life and Times of C N Annadurai. Penguin Books India (New Delhi, 2010). Where is J J Street? 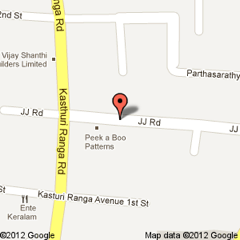 J J Street cuts across Kasturi Rangan Road in Alwarpet. 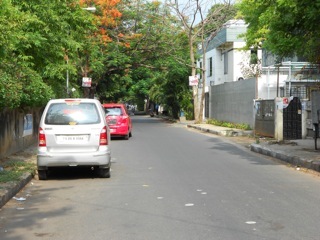 There are many other streets in Chennai named after J Jayalalitha, as well as a J J Nagar. Jayalalitha was an actor and is a politician (currently the Chief Minister of Tamil Nadu). She was born in Mysore in 1948 to Jeyram and Sandhya. She studied in Bishop Cottons Girls’ High School in Bangalore, and Presentation Convent, Church Park, in Chennai. Jayalalitha made her acting debut in a Kannada film, and rose quickly in the industry. She did 28 films with the superstar of the age, M G Ramachandran. Influenced by her contact with MGR, she joined the AIADMK (All India Anna Dravida Munnetra Kazhagam) in 1982 as propaganda secretary. Very soon, she took a seat in the Rajya Sabha. After MGR’s death, the party split into two factions, headed by MGR’s wife Janaki, and Jayalalitha respectively. Jayalalitha went on the become Leader of the Opposition in 1989. Her first stint as Chief Minister came in 1991, when she was election to form a coalition government. She has the distinction of being the first elected woman Chief Minister of Tamil Nadu. She lost in the 1996 elections, but returned to power in 2002. After a loss in the subsequent 2006 elections, she won again in 2011 and is currently in office. As with many politicians, her career has been coloured with controversy. Her most significant contributions to social welfare are the Cradle Baby Scheme and the introduction of All-Women Police Stations. Jayalalitha is an accomplished dancer, Carnatic singer as well as a proficient linguist. She is fluent in Telugu, Tamil, Kannada, Hindi and English. She is an avid reader and has an immense library. An erudite individual, Jayalalitha has been awarded many honorary degrees. Editor. (September 13, 2010). J Jayalalitha: Profile, Biography, Information. In SouthDreams. Retrieved August 26, 2012, from http://www.southdreamz.com/portfolio/dr-j-jayalalitha/.
. (May 14, 2011). Short Biography of Jalalitha Jayram. In Politics to Fashion. 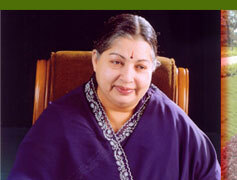 Retrieved August 26, 2012, from http://realityviews.blogspot.in/2011/05/short-biography-of-jayalalithaa-jayaram.html. 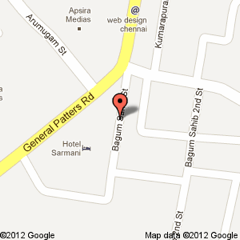 Where is Begum Sahib Road? 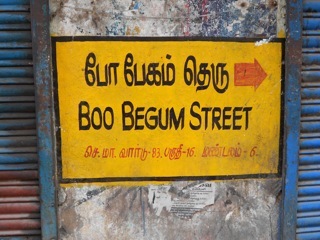 Begum Sahib Road, or BooBegum Road, is in Triplicane. 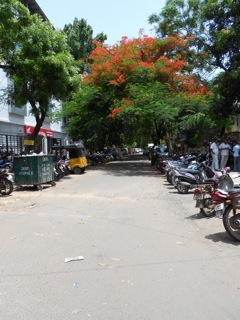 It is a small road, which leads off Thiru Vi Ka High Road (formerly known as General Patters Road). Begum Sahib, or Jahanara, was the daughter of Mughal emperor Shah Jahan and Mumtaz Mahal. She was born in 1592. When Mumtaz died in 1631, Shah Jahan was heartbroken. Jahaara took over his duties in the royal household, and became the peacemaker in the family. As the eldest daughter, she took command of the household, and thus earned the title ‘Begum Sahib’ – Princess of Princesses. Shah Jahan frequently took his daughter’s advice and consulted her on matters of state importance. It was at her insistence that Shah Jahan engaged in philanthropic activities, helping orphans, widows and the poor. Janhanara was an intellectual, and well read in Persian and Arabic literature. In 1644, Janhanara suffered severe burns when her skirt caught on fire. It is a testament to her father’s concern for her that he was so worried that state affairs to second place to his daughter’s health. For months she battled death, and was finally cured by a European physician. Shah Jahan was so grateful that he granted the doctor’s country (which is not mentioned) permission to trade in India. It should be noted that in the end, Jahanara’s sores were healed by an ointment prepared by a slave – Arif. Overjoyed by her recovery, Shah Jahan showered Jahanara with costly jewels and other presents. He even restored Aurangzeb to his former rank at her recommendation (he had earlier stripped Aurangzeb of his titles when Aurangzeb rebelled against him). Though a highly guarded royal princess, Jahanara occasionally managed to smuggle young men into her chambers. It is unfortunate to note that, if found out, these young men were put to death by a furious Shah Jahan! In the war of succession between her brothers, Jahanara supported Dara. When Aurangzeb claimed the Mughal throne, she visited his camp with a peace proposal from Shah Jahan – who offered to divide the kingdom into four, one for each brother. Aurangzeb ignored this, and imprisoned his father. A loyal and affectionate daughter, Jahanara accompanied her father during his incarceration. She tried in vain to reconcile father and son. However, on Shah Jahan’s deathbed, she extracted a formal pardon from him for Aurangzeb. Jahanara fulfilled her father’s dying wishes by caring for his other queens and surviving daughters. In spite of the fact that she had not supported him during the succession war, Aurangzeb’s respect for Jahanara led him to restore her as the first lady of the Mughal court after Shah Jahan’s death. As the first lady, she was permitted to criticize Aurangzeb and speak plainly to him about state affairs. She arranged the marriages of the younger generation. She even wore clothes that were no longer permitted for women under Aurangzeb’s regime, such as the salwar kameez. Jahanara was also an architect. She had a hand is the design of the Taj Mahal, and commissioned Chandi Chowk. She was a poet and a painter. Jahanara never married (as was the tradition among Mughal princesses), and died on September 6th, 1681. She is an icon today, an example of a woman who had power and liberty at a time when royal women were usually dissuaded from stepping into public life. Ed. Singh, N.K., Encyclopaedia of the Indian Biography Volune 1, A P H Publishing Corp. (2000, New Delhi). undefined. (n.d. ). Jahanara Begum. In Free Servers. Retrieved August 25, 2012, from http://jahanarabegum.freeservers.com/. 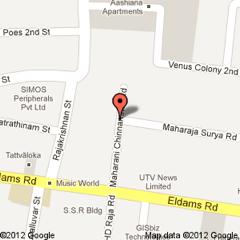 Where is Mahaharani Chinnamma Road? 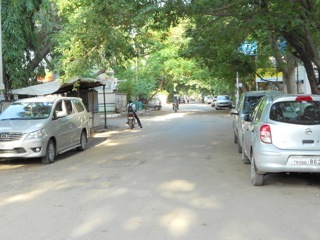 Maharani Chinnammal Road is in Alwarpet. 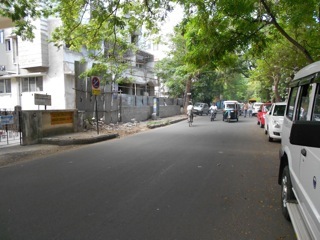 It leads off from Eldams Road, towards Poes Gardens. Chinnamma Devi was the eldest daughter of Rajah Venkata Ramayya Appa Rao Bahadur, Zamindar of Kapileswarapuram. Not much is known about her childhood and early life. In 1905, she married Meherban-i-Dostan Sri Maharaja Ravu Venkata Kumara Mahipathi Surya Rao Bahadur Garu, Sircar, Rajahmundry Sircar and Maharajah of Pithapuram, CBE (whew! ), more often referred to as Maharaja Surya Rao. They lived in Dunmore House, in Murray’s Gate Road. Surya Rao is known for having funded a classical Telugu dictionary, and also commissioning the first Telugu typewriter. Maharani Chinnamma gave birth to Sita Devi in 1917. If not much is known about Chinnamma, Sita Devi’s live is the stuff of novels. She was known as the Indian Wallis Simpson, and was famed for her beauty, style and grace. She divorced her first husband to marry into the royal family of Baroda. Sita Devi relocated to Monte Carlo, and settled down to a life of opulence and grandeur. Not much is known about Maharani Chinnamma – in fact, it was impossible to even find a picture of her, but her daughter certainly stirred the world! (June 3, 2012). The Jet-setting Maharani from Alwarpet. In The Hindu. Retrieved July 3, 2012, from http://www.thehindu.com/todays-paper/tp-national/tp-tamilnadu/article3596690.ece. 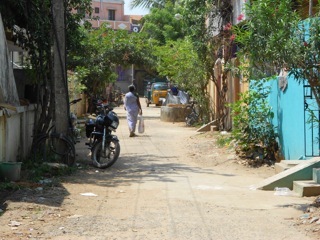 Avvaiyyar street in a small lane which runs perpendicular to Taramani Link road. There is a statue of Avvaiyyar on Marina Beach. 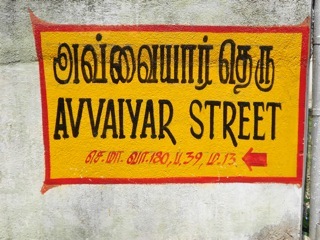 There are many streets named after Avvaiyyar in Chennai, including in Jaffarkhanpet and Oragadam. ‘Avvaiyyar’ literally means old woman. There were a few poetesses in Tamil history who merited this title, and two stand out. The first Avvaiyyar lived during the Sangam age. This was an age (it is said) of equality of the sexes. Women had equal rights and powers. Avvaiyyar’s real name is not known. She was born to a Brahmin man and an untouchable women, who abandoned her because the Brahmin was on a spiritual journey at the time. She was rescued by a passing poet. Her devotion to Lord Ganesha is legendary. When many men wanted to marry her for her beauty, she only wanted to serve the Lord. She prayed to Ganesha to take away her youth and beauty so that she could focus on poetry, music and drama. This boon was granted, making her age quickly. 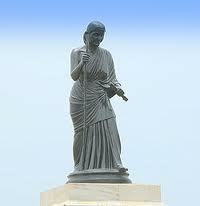 Avvaiyyar was a poetess in the court of King Adhiyamman. She sang many songs in his praise. A charming story about her reveals her cleverness. It seemed likely that war would break out between Adhiyaman and the King of Kanchipuram. Avvaiyyar went to Kanchipuram to try and prevent the war. Making this perilous journey alone, Avvaiyyar was granted an audience with the King of Kanchipuram. He hoped to instill fear in her (and, by extension, Adhiyaman) by showing her the pristine state of his weaponry and army. Avvaiyyar smartly turned the tables on him, by observing that Adhiyaman’s weaponry was blunted and broken by constant use in cutting down the enemy – thereby implying that Kanchipuram’s army was inexperienced. Thus, war was averted. Legend tells us that Avvaiyyar did not die a natural death. She was assumed (transported in her human form) to Kailasha (home of Lord Shiva). The second Avvaiyyar, who is so familiar in Tamil textbooks for children, lived in the 13th century. Her poetry is still very much in vogue today. She was the Chola court poet, a contemporary of Kambar and Ottakuttar. Her works are primarily directed at children, and they lay down basic dos and don’ts of everyday life and fundamental moral values. undefined. (n.d.). Avvaiyyar – Avvaiyyar Biography. In ILoveIndia. Retrieved May 19th, from http://www.iloveindia.com/spirituality/gurus/avvaiyyar.html. undefined. (December 12, 2008). Avvaiyyar. In Tamil Thosiyam. Retrieved May 19th, from http://searchko.in/literature/ta-cached.jsp?idx=0&id=95.